Andre Hajdu was born in Budapest [Hungary] in 1932. He studied there at the Ferenc Liszt Academy under Szervanszky and Ferenc Szabo [composition], Szegedi [piano] and Zoltan Kodaly [ethnomusicology]. In 1956 he emigrated to Paris and continued his studies at the Conservatoire National de Musique under Darius Milhaud [composition] and Olivier Messiaen [philosophy of music] Since 1966 he lives in Jerusalem. 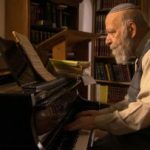 He taught at the Rubin Academy of Music both in Tel-Aviv and Jerusalem and at the Music Department of the Bar-Ilan University. His activity as a composer can be understood as an ever-changing quest. In earlier works [“Little Hell”, “Plasmas”, “Journey around my piano”] written in France it’s a search for personal expression through means which could be described as surrealistic in their mixing of contrasting styles and esthetics of “stream of consciousness”. Even in later pieces as “Continuum”, “The unbearable intensity of Youth”, “Bashful Serenades”  and “Fantasia/Ressissei Laila”  one can feel this trend. In his first period in Israel Jewish subjects appear: “Ludus Paschalis”, “Mishna Songs” [1972-73], “Rhapsody on Jewish Themes/Terouat Melech”, “The false Prophet” , “Tehilim/Psalms”, “Jonas”  continued later by “Dreams of Spain” [cantata about the expulsion of the Jews from Spain] , “Job and his Comforters” , “Ecclesiaste/Kohelet” and “Birth of a Niggun” . These pieces are however far enough from the usual liturgical or folklore-oriented music and find in Jewish studies and History the base of their approach. Parallel to this a corpus of pedagogical music was published consecrated to the idea of teaching music through a creative approach [involving the player in the process of composing and using the pieces as a tool for improvisation] as “Milky Way”, “Art of Piano Playing”, “Book of Challenges”, “the third Hand”, “Musical Chairs/Rotative Sonatine” and the “Concerto for ten little pianists”. His compositions were played by Orchestras and Ensembles as Israeli Philarmonic, Jerusalem Symphony, Israel Chamber Orchestra as well as the Philadelphia, Leningrad, Berlin, Stockholm and Munich Philharmonics, Ensemble 2e2m [Paris], Voices of Change [Dallas], Musica Nova [Tel-Aviv], Kaprizma [Jerusalem] etc…. Works available in CD : “On Light and Depth” [IMI], “l’Ecclesiaste” [RCA Victor/BMG], “Terouath Melech” [Plane], “Dreams of Spain” and “Concerto for an ending century” [Hungaroton], Chamber Music [B.A.C.H DIES, Birth of a Niggun, Instants suspendus, French Sonatine, Mishna Variations] In 1997 he received the Israel Prize for his life-work. In 2005 he received the title of Doctor Honoris Causa of Jerusalem Hebrew University.